Let’s imagine you are looking underwater. A fish goes past you by the side, but you could only get a glimpse of it. You look towards it, but it is gone. A luscious, magnificent creature, gone just as swiftly as it arrived. All you needed was 180-degree angle vision……………………well we have what you might need! With today’s side imaging fish finders, you can see anything, from mermaids to leviathans that pass by the side. With this wide a Field-Of-View, do you really need much more than that? I don’t think so! With that, let’s talk about the best side imaging fish finder! 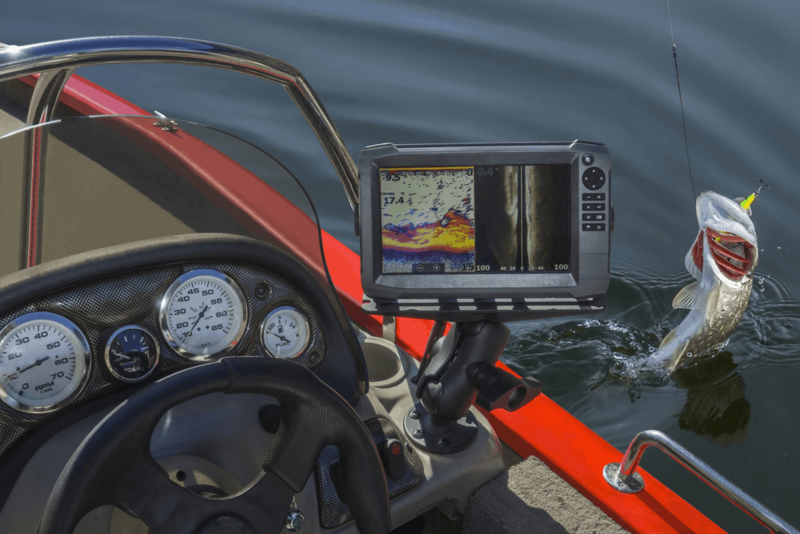 Why Buy a Side Imaging Fish Finder? We start this list with the Humminbird Helix 5 G2. This fish finder looks like a digital camera of sorts, with a black, plastic body. The screen takes up 70% of the front face of the device, while the buttons are concentrated on the upper-right portion. The largest button on the device is the directional buttons, which are on a ring. The sensor on this is the HELIX 5 CHIRP G2 DualBeam PLUS sonar transducer. The sensor setup has a dual frequency capability with one 83 kHz and one 200 kHz. However, the device itself is capable of 50 kHz frequency as well. In addition to this, it uses a dual-beam setup with beam angles of either 60 degrees or 20 degrees. These form the basic Mid CHIRP and High CHIRP frequencies. Using this enables you to find groups of fish first, and then target individual ones. Take this from the cheetahs, find the herd and prey on the weakest one! Higher precision CHIRP can help you get as accurate as 2.5 inches, meaning that is how far away each fish can be from other fish for them to be identified. The sonar is capable of scanning into depths of as much as 1500ft. It can also detect water temperature. The sensor also has built-in GPS too. The screen is a 5-inch Color WVGA Display. On the left, you can see a bunch of details, including depth, temperature, water speed, position, etc. It has two screens, with a sonar display and a GPS map. The sonar has a depth scale, and fish are shown in red and yellow. The map works the way all maps work, of course. You can also set waypoints and put markings, and a Micro SD card can be used to store most of these. ​​​​​Great precision and fish sensitivity. ​​​​​​Does not work on shallow water. Next on this list is the Humminbird Helix 7. This looks much like the previous name on the list, but it looks much sassier. The look is much more polished and has a more modern feel than the 5th version. It has a screen that takes up much more of the space than anything else does in the middle. As usual, the buttons are placed on the top right corner while the power button is on the bottom right. Doesn’t get more Humminbird than that, does it? Also, like them, you get a good CHIRP transducer to go along with it, which comes externally of course. The CHIRP sonar is capable of Side Imaging and Down Imaging, with an impressive range of 480 feet of imaging side-by-side. You can also get the CHIRP DualBeam Plus with SwitchFire, which is, in simple words, the ability to project two different beams that have enhanced scanning abilities. This is achieved because of the ability to use 2 different frequencies (or 3 if you upgrade your transducer). As we said already, you can see two different stuff using two different frequencies, which will help give you even more details. Talk about pulling all the rabbits out of the hat, huh? This was the usual beam. The side beam works by having a beam of a frequency of 455 kHz with a beam angle of 86 degrees. Side imaging has a range of 480 feet because it can send beams up to 240 ft. on both sides. The Down Imaging uses three modes of Narrow, Medium, and Wide. The screen shows all the basic details and can be made split-screen for simultaneously using two different beams. Overall, a solid piece of versatile fish-finding magic! If you enjoy a blast from the past, the Helix-5 SI is just what the doctor ordered! It obviously looks older, with a similar Humminbird shape with the screen and the buttons. You know what they look like by now. The device itself isn’t very heavy for what it does, weighing a small ten pounds. It is also not very big. The sonar it uses is Humminbird’s own DualBeam Plus with Side Imaging and Down Imaging installed. The transducer that you get with this supports all of these types and also has a temperature sensor installed. Since it is connected externally, you also get a 6m long cable to add just a bit on top of the existing height. The standard depth that the transducer can scan is up to 1500 ft, while Side Imaging goes as far as 100 ft. How this works is that you can find all the groups of fish within your field of view in a flash, and then use the regular sensor for better targeting. Plus, it does a really good job in shallow water. To get the DualBeam effect the transducer is able to transmit two different frequencies of sonar, either individually or simultaneously. The 200 kHz beam has a beam angle of 20 degrees, while the 83 kHz beam has an angle of 60 degrees. What this does is allow you to first scan larger swathes of the water for a sign of fish, and then zero in on the selected prey. And if you use them together, what more do you need? The display shows the usual information such as depth, water speed, temperature, etc. You can use split screen with the DualBeam Plus. In addition, it has GPS too, which you can use for mapping. The Garmin Striker 7SV looks a lot like some of the other Side Imaging fish finders on this list, but the button placement and overall design is more pleasant, no doubt! Like most, the device’s screen takes up the lion’s share, but the buttons are uniquely placed. The right side of the screen has a bezel in the middle, which holds the directional keys. The other buttons encage them vertically. The symmetry is sure to please! Now, the magic happens in the transducer. Like others on this list, the transducer is capable of emitting beams of several frequencies to get a wider range of information. It emits CHIRP sonar, with capabilities of sending out either a 77 kHz beam or a 200 kHz beam on the basic transducer. On the other hand, side imaging is done on this with its DownVu and SideVu features. Both of these have beams with a frequency of 455 kHz. What this basically does is let you look to the sides, and the extremely high frequency means that you see a lot of details but at a far lower range. The best part of this is that you can use all of these at the same time. Speaking of which, the depth on this is also decent. You can see up to 1100 ft. in saltwater and 2300 ft. in freshwater. You also get to choose between high and medium CHIRP using the frequencies. For icing on the cake, you also get GPS positioning to mark prey, habitat, or anything else. The display is also good, with a triple split screen for each frequency. You get depth, temperature, and fish finder voltage information on the top left, while individual depth readings are provided by depth scales on each screen. It looks exactly like the other Humminbirds, with the exact same positioning of the various elements that make up the fish finders. But don’t mistake it with the others, it stands out on its own quite a bit. First of all, it uses Humminbird’s SwitchFire sonar technology in the default transducer, of course with side and down imaging installed. As a result, the depth of scanning you can choose from are 100, 600, and 1500 ft. due to variable frequency options available on the fish finder. The display is where this particular fish finder shines. It has a dual screen setup, with a smaller screen in a larger screen. The screen is huge, is capable of 800x480 resolution and in 256 colors. You can also see in the dark or sunlight due to backlighting. But the main part is the bonded glass display which, as the name already says, uses bonded glass. What this gives is much clearer, cleaner picture of the sonar readings. This, in conjunction with the better display, gives something that is better protected, easier on the eyes and gives more precise information. You can also zoom in on this thing, and you won’t be losing much clarity. And if you want to see why that is important, go look up how zooming ruins picture quality! It also has superior, built-in GPS too. It lets you mark stuff on the map and accurately track locations of everything that you passed on the map. Speaking of maps, another cool thing is the fact that you can use this fish finder with just about any chart package in the U.S. It also has several features such as underwater contouring, AutoChartPro, Navionics Gold, and even LakeMaster, though we can’t guarantee you will be the master of any lake with it! Another Humminbird fish finder on this list, the Helix 5 CHIRP DI GPS G2 is another stellar, albeit typical-looking, Humminbird fish finder. It has the same screen size and button placements, although there are some differences when you talk about the screen itself. Let’s talk about the sensor first. It uses CHIRP sonar, meaning it uses CHIRP for all kinds of scanning, from Down and Side Imaging to the basic DualBeam Plus (yeah, this is quite common among Humminbird products). As with most of their products, there are two variations of CHIRP to choose from. With DualBeam Plus, you get frequencies of 455 kHz and 200 kHz, at angles of 16 degrees and 28 degrees respectively. I’m sure you are familiar with this sort of setup but do note that the frequencies here are somewhat higher than usual. In short, this means that you get limited range, but in exchange, you get excellent information clarity. As for the Down Imaging, you get 455 kHz frequency with a 75-degree beam angle, while with the 800 kHz frequency the angle is 45 degrees. Similar to most others, this is basically Medium and Low CHIRP settings, which has its own pros and cons. What you get with this is a range of 600 feet for the DualBeam Plus, and 350 feet while using Down Imaging. You probably don’t need to be a genius to conclude, then, that this fish finder is probably ideal for shallower or fresh water. The screen is also incredible; a 5-inch display with a brightness of 1500-NIT. On the left is a plethora of information that comes with aquatic scanning, including depth and temperature readings. But there’s more. You can set it to split screen for dual frequency details, and even a map with GPS features. The Helix 9 takes Humminbird’s Helix line to the next level. It has a display that looks sleek and curves that match its time. The screen is wider, and there are even subtle changes to the button layout, with an additional line of buttons over the power button. But don’t worry, all of these have been placed onto something that looks distinctly Humminbird’s and distinctly a product of the Helix line. Like most others of the line, this also comes with Side and Down Imaging, DualBeam Plus, and even has SwitchFire sonar installed into it. Although this comes with the usual dual-frequency capabilities of old, there are several features that help it stand out. For one, you have the choice of Max and Clear modes with SwitchFire. In addition, AIS technology, which is installed on the sensor, aids in areas of murky or translucent waters by providing information of regions that are otherwise difficult to see. With the basic 2D mode you can probe up to 1500 ft. deep with the lower frequency. As we mentioned already the higher frequency will help you capture more detail but to a lesser distance. Now, the screen is where the upgrade is most noticeable. It uses a 480x400 resolution display, but the screen itself is a 9-inch mammoth on its own. It is extremely bright and has a 65,000 color screen. It also has great GPS functionality. Not only can you use an AutoChart or AutoChartPro with this fish finder for mapping, but there are also many markers and paths whose data is already stored into the fish finder. The GPS itself, which is built-in, is extremely accurate and shows positions really well. Overall, this is a solid fish finder for more recent times. ​​​​​​​​​​​Amazing screen and display quality. Garmin makes some robust but handy fish finders, and this one is no exception. The fish finder stands on bottom support, which is basically cross-shaped legs. The device comprises of a decently-sized, 7-inch screen that is slightly wedged into the fish finder. Like many other fish finders, the buttons are placed on the right of the screen too. The buttons are placed symmetrically, and there isn’t anything quite like symmetry on the eyes! The clear upside of this fish finder is its magnificent sonar. It uses a broadband CHIRP sonar which is capable of 2D CHIRP as well as Side and Down Imaging thanks to its SideVu and DownVu CHIRP. The 2D CHIRP is capable of probing up to 2300 ft. of freshwater and 1100 ft. of saltwater. With Side and Down Imaging the maximum range is up to 500 ft. This is because the 2D CHIRP uses dual frequencies with angles of 24 degrees and 16 degrees for a 77kHz and 200kHz beam respectively. While SideVu and DownVu use fan-shaped beams, the angle is 50 degrees at 455 kHz while it is 30 degrees for the 800 kHz beam. The display gets the job done, with a variety of features including a split screen showing a map of the surrounding area and sonar readings from multiple frequencies from both 2D CHIRP and SideVu CHIRP, for example. It also has a flawless GPS navigation system. It has an internal receiver with a rate of 5 Hz and is capable of saving as many as 5000 marks and 100 paths. You can also get pre-installed charts of American aquatic bodies, and there are certain additional features installed too. Needless to say, this gets the job done really well on the scanner front. And that is why this is a go-to for many. ​​​​​​​​​​​​Syncing issues with Chart Plotter. Are you getting tired of seeing Humminbird Helix names on this list? Well, that’s too bad because we got one more! But this isn’t a joke, mind you, because they do make some of the best side imaging fish finders out there. This, once again, looks like a more polished Helix fish finder with subtle changes, but the Humminbird mark is there for all to see on it. One pattern is that the screens keep getting bigger, though! It uses the usual DualBeam Plus and Side and Down Imaging sonar with SwitchFire abilities installed on them. The DualBeam Plus operates at frequencies of 200 kHz and 83 kHz with angles of 20 degrees and 60 degrees respectively. On the other hand, the Down Imaging uses a 455 kHz beam with conical angle modes for narrow, medium and wide. The Side Imaging can use either a 455 kHz beam at an angle of 86 degrees or an 800 kHz beam at 55 degrees. What this results in is an impressive 1500 ft. depth range in the DualBeam Plus, while with Side and Down Imaging you can look as far as 100 ft. deep. You also get a good 480 ft. of horizontal coverage with Side Imaging. All of this only points to one thing, YOU GET TO SEE A LOT! The screen has a superior resolution of 1024x600, giving more detailed information on the screen. It is larger too, at an impressive size of 10.1 inches. Backlighting is brighter than earlier iterations too and is also glass bonded, making it secure and glare-proof. Plus, it is also waterproof, you know, just in case your clumsy hands splash water onto it! It also has a great navigation system built into it with enough features to suit all your needs. Doesn’t get as good as this, does it? ​​​​​​​​​​​​​Highly accurate sonar and display. ​​​​​​​​​​​​Somewhat difficult to set up. Another typical-looking Garmin Striker product but with distinguishable features on the inside. As the saying goes, don’t judge a book by its cover! And you would be wrong to do so because this is quite different from others on this list. Of course, it still has the same display and architecture as other Garmin Strikers, but what matters is what’s on the inside! The Garmin Striker 7SV uses Garmin’s traditional CHIRP sonar, which includes two types of sonar, one is a Down Imaging sonar called ClearVu, and the other a Side Imaging sonar called SideVu. With such a setup you get much more accurate fish targeting and better separation of fish and natural objects underwater. In short, better zoning in on fish and less effective camouflage for them! 2D sonar uses frequencies of 77 kHz and 200 kHz, with the capacity to go as low as 50 kHz with the right transducer. ClearVu and SideVu are capable of beams of frequencies of 260 kHz, 455 kHz or 800 kHz. This combination yields a range of 800 feet using 2D sonar, though a lower frequency can give one with a depth range of 2000 feet. ClearVu is limited to 250 feet, while SideVu at twice that. SideVu is obviously larger because it emits 2 beams in opposite directions, doubling the range of ClearVu. The best part of this is that unlike most others, this fish finder does well even while moving. But don’t go overboard with the speed, a modest 10mph should do fine. The navigation is another strong suit, with the fish finder capable of saving as many as 5000 waypoints to its memory, including waypoints and landmarks. Using route tracing capabilities installed you can also record your route, though you do not get whole maps. To make things short, this fish finder does everything you need doing well, without going overboard. That’s why we love it! ​​​​​​​​​​​​​​Easy to get started with. While most work can be done by a simple 2D transducer, Side Imaging can really enhance your experience of using fish finders. The primary benefit is that when you use side imaging in conjunction with 2D sonar, you get a detailed breakdown of the happenings underwater. Having both a vertical and bird-eye-view of sorts will significantly help in finding exactly where the fish are located. The multiple perspectives can help you trace out more than having a single perspective. 2D sonar can’t tell things that a sideways view can! This particular part becomes handy when you have split screen with your fish finder. It then becomes a matter of seeing two visions of whatever is happening underwater and then coming to a more informed judgment about what you should be doing next. Additionally, Side Imaging has an enormous field of view, with some covering angles as much as 180 degrees wide. Once you add this to the fact that the sonar has a decent range, you can cover a large portion of the water almost instantly. And you know what that means right? You find more fish! And since most fish are found in clusters, they are easier to identify and you can plan your catch easier. Of course, faster coverage not only means more fish but also faster fish identification. You no longer have to manually trace your sonar over the area where the fish are located to find them. Side imaging will do that for you in a flash. Another really big plus point for Side Imaging fish finders is that it centers the boat, so you get a better idea of where each fish is compared to your positioning. If Einstein’s theory of relativity did anything, it was that everything is a matter of perspective. Seeing the fish underwater is a good way to get started, for sure. But knowing where exactly the fish is versus where your boat is can really make a huge difference. You can get a real-time idea of where the fish is, so you can put your fishing net or reel in the right way. With 2D sonar, you might throw in the reel towards the general direction, but not exactly where the fish is located. Oh, we should also tell you the fact that it prevents fish from hiding! Most of the fish hide in aquatic structures or vegetation. When you look at it from either a 2D sonar or even an underwater camera, fish might be hidden behind something which sonar cannot detect. But if Mr. Fishy thought he could hide forever, he was wrong! Because with Side Imaging you can see him in his hidey hole! Most of the things that can hide fish underwater don’t have an overhead enclosure of any kind, so whether it is something solid like a shipwreck or simple grass, you can still find the fish. 1. Will Side Imaging Work Well in Deeper Water? A: Most fish finders have particular depth ranges for their sonar. Once you exceed those ranges, the sonar beam cannot come back to the transducer so you will get wild readings (you will know it too). Side Imaging focuses more on extremely large coverage at a shallower depth so it may not give the desired results. But then again, 2D sonar is there for the deeper waters. But if you insist, you can upgrade your transducers for better coverage too. 2. Why do Frequencies of Beams Matter? A: Frequencies determine how much information is transmitted and how far the beam goes. A lower frequency beam can travel far because it bounces off fewer objects. However, with the higher range, you lose a lot in detail. On the other hand, high frequency has lower range but provides better clarity for display. 3. What Perspective am I Seeing With Side Imaging? A: Side Imaging is essentially a bird’s eye view spanning an angle of 180 degrees from one side of the boat to the other. The beams are sent on both sides of the boat underwater, so you get a horizontal view instead of a vertical view i.e. if something is to the right, left, in front or behind. However, you will not get information regarding depth on the side-imaging sonar. But hey, you win some, you lose some, right? Now that we have armed you with so much knowledge, it is time to take your fishing skills to the next level. Using a side imaging fish finder, you can get instantaneous results and get a lot more fish found a lot quicker. We don’t know about you, but they sure seem to be good returns on investments to us!